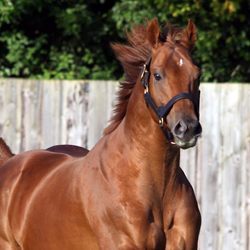 Top buyers get stuck into Tamayuz Yearlings in 2012. The 2012 autumn yearling sales brought confidence in some stallions and abandonment for others in the European sales ring. Sea The Stars finished off a very successful first season with five individual stakes horses which include Group winners Meiner Eternel and Sir Prancealot. This prompted trainer Mark Johnston to purchase three Tamayuz yearlings, Shadwell purchased three, Peter & Ross Doyle, David Redvers, C Gordon Watson, Blandford BS (2), Haruya Yoshida, John Ferguson, Rabbah BS, SackvilleDonald (2) and BBA Ireland all signed dockets for Tamayuz yearlings in 2012. With a yearling average of €60,000 off a €15,000 nomination fee, Tamayuz continues to impress the judges.